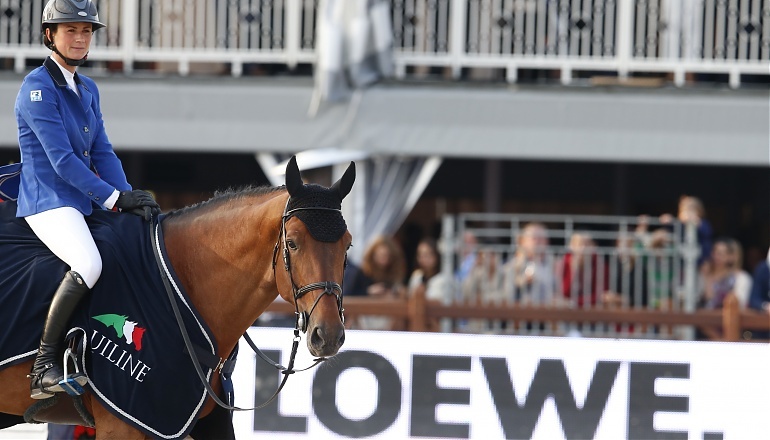 Home Equestrian News Pénélope claims her second big win in Antwerp. Pénélope claims her second big win in Antwerp. Pénélope Leprevost has claimed another fantastic French win at Longines Global Champions Tour of Antwerp, taking the CSI5* 1.50/55m, sponsored by Loewe, riding Vagabond de la Pomme. In second place was Rolf-Göran Bengtsson (SWE) riding Unita ASK and in third, Luciana Diniz (POR) riding Lacontino. The course was tricky and technical, faults claimed many top names from the 46-strong start list. The errors were not localised to any particular obstacle, but spread about Luc Musette’s (BEL) twisty course. Just six made it through to the jump-off, where Marcus Ehning (GER) and Sabrina boldly set out to make the pace only to lower a single rail. Kevin Staut (FRA) also had four faults before Pénélope took the lead with a clear from the middle of the draw. McLain Ward (USA) set out to catch her time be he also had four faults. Rolf-Göran Bengtsson opted for a careful clean round to take second place, while Luciana Diniz was a close third also jumping a smooth clear. With the feature class of the show to come tomorrow night, France’s leading lady is looking hard to beat. Pénélope is sure to go into the Grand Prix favourite, but with such an array of show jumping talent in attendance it’s hard to pick a potential winner. The big class of tonight, the BMW Masters, will begin at 9.15pm (local time) featuring ten of the show’s top riders. You can follow all the action live on GCT TV. Previous articleLeprevost wins Thursday night’s big class in Antwerp. Next articleA beautiful new BMW for Zanotelli.